In the shadow of a leafy coca plant lies an unmarked grave. Many like it are scattered in the lush plantations of Catatumbo, bearing unidentified victims of Colombia’s deadly coca wars. The International Committee of the Red Cross has taken on the task of locating graves and identifying remains for victims’ families, cautiously stepping in where government and local authorities still fear to tread. Locals believe the man in the grave is Polilla, “the moth.” It’s the nickname given to the coca-leaf harvester whose bullet-riddled corpse turned up here 15 years ago – another victim of Colombia’s legion of armed groups. He wasn’t yet 30. Local cocaleros – coca growers – buried him here, close to where his body lay unclaimed for days in the rain. His family did not travel to the region to reclaim his body, fearing repercussions. Last year, they contacted the Red Cross. “We don’t want to be a substitute for the state. But when access is impossible, we act to search for the missing,” says Red Cross coordinator Derek Congram. Between 1999 and 2004, hundreds of coca leaf-harvesters, or “raspachines” – the lowest form of existence on the drug trafficking chain – were killed by far-right paramilitaries or by leftist guerrillas who accused them of working for the enemy. The ICRC is currently looking into 1,888 cases of missing people in Colombia, including hundreds in Catatumbo, in Norte de Santander, on the border with Venezuela. That is just a sample of the 80,000 people missing over a six-decades span of violence and an armed conflict which, for weary Colombians, seemingly has no end. “The quantity of blood spilled in this region is enormous. There are many dead, farm workers as well as farm owners,” said a leader of the peasant community, who identified himself only as Rogelion. Nobody wants to be identified here. Time has passed, but the threats continue. Especially now given that the production of coca – the base ingredient of cocaine – has shot through the roof. The northeastern area of Catatumbo is home to 16 percent of Colombia’s booming coca plantations. Decades into the government’s cocaine war, the U.N. warned last year a record 171,000 hectares were under coca cultivation – a size roughly equal to the same number of soccer fields. It is possible that Polilla’s murderers no longer operate in the region. The most powerful group, FARC, officially disbanded under a 2016 peace deal. 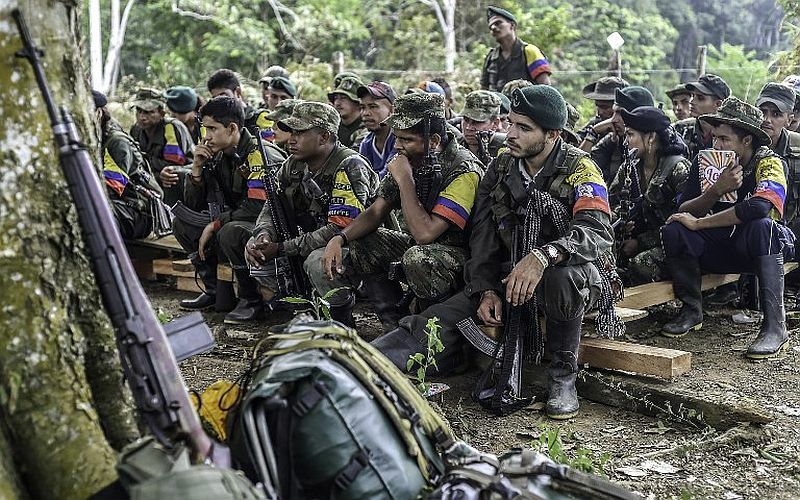 But hundreds of dissidents remain active, battling for territory and smuggling routes with Colombia’s last active rebels – the National Liberation Army (ELN) – and criminal gangs that have strengthened their hand in coca-growing areas. Before committing themselves to Catatumbo’s treacherous mountain trails, the Red Cross team negotiated security guarantees with the gangs who control the area. They wanted to ensure the approaches to gravesites were not mined. The ICRC finally reached the site where Polilla had earned a meager living, and found a violent death, 15 years ago. Picks and shovels in hand, the team hacked at the loamy soil. Less than a meter down, rubber boots appeared, then a flap of plaid shirt wrapped in a hammock. There were no bones left. “This is not an ideal result. But it’s not a failure either,” says Congram. In some cases “the remains have decomposed, but there are personal items that identify the person. Since 1997, the Red Cross has recovered the remains of 151 missing people. Whether all that is left is bones or simply clothing, it hands them over to forensic scientists, though identification of the remains has not always been possible. This was the case for another Catatumbo local, Aurelio, who lost his brother, a 19-year old raspachin killed by paramilitaries in 2001. It seemed his brother’s body was located in a particular coca plantation, along with three others. But a landslide caused the graves to shift. The ICRC postponed the search pending more precise information. Aurelio’s wait goes on. Catatumbo remains a ticking bomb, as narco gangs clash frequently with ELN, remnants of the officially dissolved People’s Liberation Army and FARC dissidents. Occasionally, even with government troops sent to quell the violence. As they prepared to leave the area, the Red Cross group had one more job to do. Stopping at a cemetery, they exhumed the remains of a man allegedly executed by guerrillas in 1993. His family had fled, without being able to give him a proper burial. From the grave, they recovered all that remained – tattered clothes and bones.